Spindrift is spectacular. Built in 2016 to exacting standards, it will appeal because its thoughtfully designed and lovingly furnished. Accessed by steps or funicular, Spindrift is elevated enough to command 180° views, set back enough to be peaceful and yet close enough to walk to the harbour, the beaches, the pavement cafés and restaurants for which Kalk Bay is famous. Wine farms, golf courses and big-ticket sites such as Table Mountain, Kirstenbosch and Robben Island are easily accessible. The nearest beach is small and charming with rocks on either side. The further beaches, (still within walking distance) are big and the swimming is safe. The surfing is great everywhere. With a view of the sea, down filled sofa and two armchairs, round dining table, TV with full cable viewing, cupboard for books, glasses, table linen. I just loved sitting in the sun on the patio in the morning looking over the sea reading a book in between trying to spot whale spouts or Dolphins rise out of the water. My wife enjoyed the shade. The property was ideal for two and beautifully decorated and although very close to lovely restaurants, we enjoyed cooking in on occasions as we stayed for one month. Louise, Guy and Angelique were great and if anything was needed or we required help, it was no problem. We do plan to return to this ideal accomodation in the future. Beautiful view, comfortable and safe apartment! 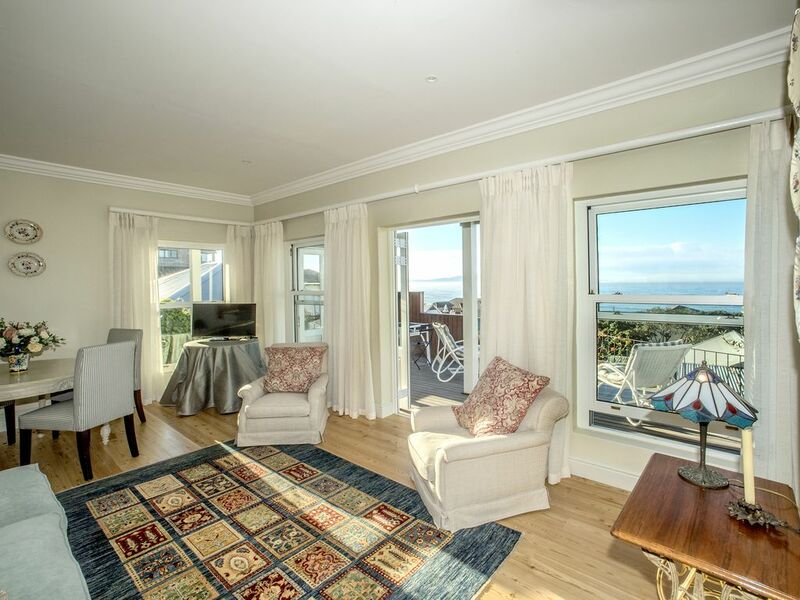 The pictures do not even describe how beautiful this setting is - the porch overlooks False Bay with beautiful morning sunshine and sunrise. I was greeted by the host and her assistant and felt very comfortable as a woman traveling alone with the security in place. Great shops and restaurants within walking distance - I also walked 30 minutes each way to Muizenberg Beach for groceries and it was safe and scenic. Comfortable bed; well-equipped kitchen; TV and many channels; books; and even a towel-warmer in the bathroom. Had a relaxing stay and was quite rejuvenated. Thank you! Thank you Jennifer for the lovely review - really spectacular! Am so thrilled that you enjoyed your stay and that you got home safely. We look forward to seeing you again in the future. I was given a Spindrift weekend as a birthday present, and it was a sublime, luxurious weekend. If you want to spoil a loved one, this is a great gift! From the moment I discovered I could sail up the hillside in the glassed-in, silent funicular (instead of trying to clamber up a long flight of stairs), to the moment I said sad goodbyes to hosts, Louise and Angelique, I was cossetted and enfolded in pure bliss. For starters, the decor is sumptuous and tasteful, yet homely and carefully chosen. You can sink into soft armchairs in the restful lounge or sit in spacious wicker chairs on the balcony, which is broad and welcoming and overlooks the ocean. And everything you could possibly want is there, including binoculars, WiFi, DSTV, heaters, and a well equipped kitchen. In the cupboards are the basic essentials, so you can have a cup of tea or coffee when you arrive, giving you time to catch your breath, and soak in the beauty. And then there's the bed! Once you sink into that bed you will never want to get out. A ruby-red mohair blanket adds to the comfort -- and I recommend wrapping yourself in it, and sitting out on the balcony in the cool evenings.That's if you don't want to go out for meals or wander around Kalk Bay, which is a delight in itself. There are so many places to pop into, so much delicious food, and so many quaint alleyways to explore. I chose not to, because I know Kalk Bay -- and besides, why leave Spindrift for a minute, when it's so completely and utterly everything you'd want or dream of, while taking a restful weekend away. Thank you, Louise, Guy, Angelique and Ben, for a memorable time and for your warm generosity. Loved the location, the people and the apartment. Within walking distance of the best restaurants and lovely views of the sea. Das stilvoll eingerichtete Apartment bietet für zwei Personen ausreichend Platz, die Küche ist sehr gut eingerichtet und das Schlafzimmer äußert erholsam, aber das besondere ist der Blick auf die Bucht mit einem wunderschönen Ozean, von Bergen umsäumt mit pittoresker Uferbebauung. Wir haben uns sehr wohl gefühlt und können sowohl die Unterkunft als auch das überaus freundliche und hilfsbereite Vermieterpaar nur empfehlen. Please treat our apartment with the same respect with which you'd like yours to be treated.